Agree. I like her center part hair style. New stylist with her ? A face refreshment I guess. She was the lst month out the scene because of some darm infection..
She was on sick leave only for 12 days, and, at least to my eyes, she looks exactly the same as before, i.e her usual radiant self with a face where her age shows in a beautiful and natural way. She is in her native country in these pictures, I suppose that as well as the opportunity to speak Spanish for a change make her happy. I see nothing wrong with it, if someone with a strong public presence be corrected by a cosmetic surgeon. She has had a lot of stress and strokes of fate in the last years. Only when it gets habitual it is questionable. I agree. The royal family works with it s image. Their public appearence is part of the job and looking good too. This was an event of world exposition. On the other hand I can imagine that she is back in her homeland, the weekend before she had a school reunion to celebrate 30 years of graduation... it sounds absolutely not out of anybody s mind that someone in her position would had liked to look top of the world. She is also a woman. And she did look better than average. And most of all, she looked happy. Yes same opinion as Eleonora and monty, the difference is obvious but no objection neither. The word "refreshment" probably both physically and mentally is adequate. 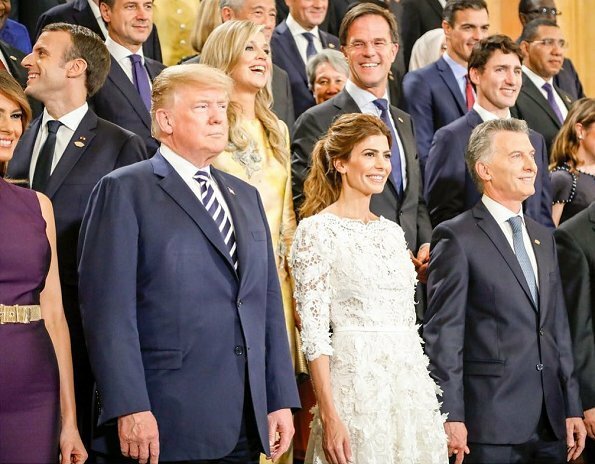 El vestido azul de O de la Renta es original y muy bonito; el Natan es horrible. El bolso beige abierto y tirado en el suelo hace muy mal efecto. 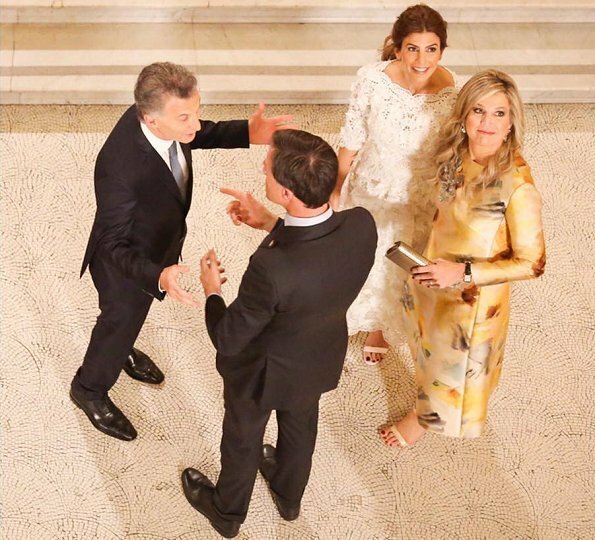 Juliana Awada va vestida de novia, no entiendo esta elección. ¿Qué tiene que ver el calor? 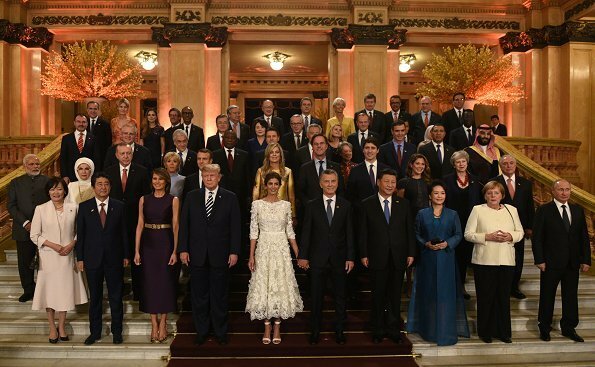 He dicho que encuentro rara la elección de un vestido que me parece de novia para esta reunión. ¿Me das permiso para tener mi propia opinión? ¿O sólo se reduce a buscar atacar a otra mujer que no está ahí ni pinta nada en esta historia? Las comparaciones son odiosas. En Madrid aún hace calor en octubre y, que yo sepa, en Argentina el verano no ha entrado todavía, están en primavera. No hace falta que repitas la monserga cambiando 2 palabras, anónima. Angie, ditto. Although I think Awada's dress is fabulous, it does have that bride look to it, and in another setting it would have been a winner for me. Anonymous @ 12:05 what's your point about October, and Madrid , if you are alluding to Queen Letizia wearing winter white in the fall, I am sure you know that in the world of fashion in 2018 that is a very common thing ( Ms Macron comes to mind , among many) . It looks to me that your comments are so biased and somewhat misplaced, also there is a very easy way to use a name on this forum, rather than the overused anonymous, not to mention that it would just show courtesy. 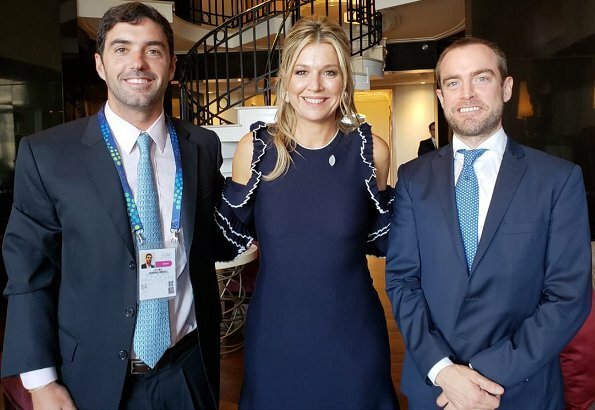 Queen Maxima is looking lovely and doing a great job for her country. For me both dresses are ok, quite different and suiting perfectly for different events. I saw video of Maxima in the blue dress and she looked beautiful. But, it looked like she could barely walk in her heels. Tired of seeing these shirts and dresses where it looks like the top of the sleeve has been cut out. It may be somebody's fashion now but I will be glad when it is gone. If it had been a normal sleeve with a ruffle I would love the navy dress. The yellow Natan is beautiful. Her hair is nicely styled in both appearances, whether its hers or not, who cares, it looks great. I totally agree with you! I don't like those sleeves either. And that was exactly my disappointment about her blue dress. It could have been beautiful with the ruffles. I kinda like the blue dress, but not the sleeves. The ruches are nice though. More flattering than the previous one. The yellow dress I do not like; ik looks like a strange cut or fit. Her hair is nice on both occasions. Both lovely - the navy is great and I'm shocked but I like the Natan. In fact, I've liked a few Natan outfits recently - I mustn't be feeling well. I'm not a fan of the "cold shoulder" look, but I have to say that this is a dress that works and is flattering on Maxima. The ruffles accented with white have a sort of flamenco vibe that fits with a Latin American locale (alright, I know that Argentina is famous for the tango :-D). I was thinking of dance as well when I saw the dress. And what´s more, I think it would pass just fine as a tango dress (in fact, much more so than flamenco). It seems we have more equality for women. Thousands of women in the 1970s, 1980s, even the 1990s would have been advised the blue dress is inappropriate for such a top level summit for a woman who wanted to be taken seriously, yet there she is. I like the navy dress, but I agree that it is the wrong choice for the occasion. 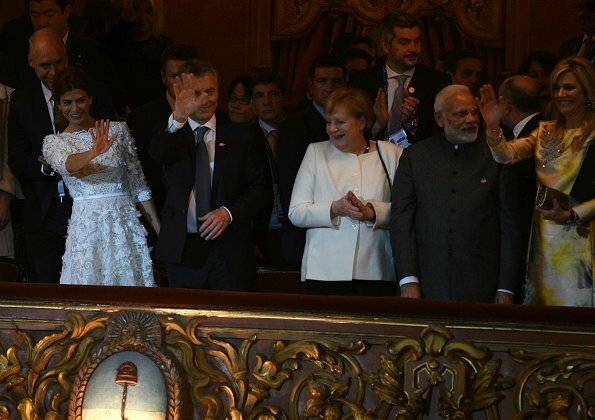 It´s better suited for a tango club than the G20 summit. 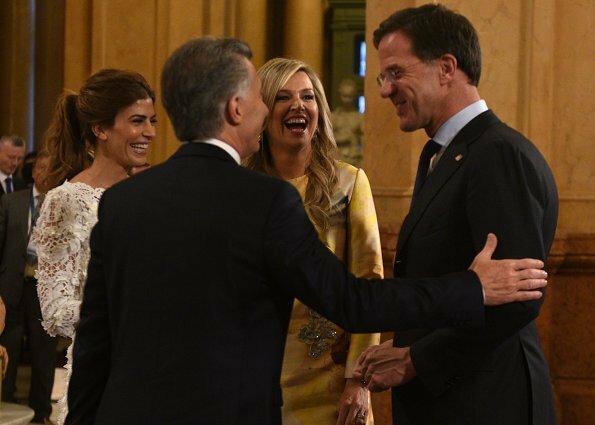 Die mouwen vind ik lelijk voor een koningin, dat heeft geen stijl. MAXIMA is mooi in Natan maar die applicaties lopen verlopen in de bloemen-stof. Full marks to the blue dress. The 2nd dress is serviceable. Mrs Macri and Mrs Trump look fab. Fashion aside, Q. Max looks happy and relaxed (there's no place like home?). Madame Peng dominates the second picture. Her graceful posture and elegance immediately draws the eye. Her husband has also quietly displayed some expert tailoring in the last few days. I like both ones and her hair is rather nice too. Maxima should continue to look to outside designers. She looks great in the de la Renta. Her hair is beautiful, modern and the extentions make it look healthy. The Natan is not my favorite. It looks a little big on her, and very busy. It looks like embellishments were added, but it is difficult to tell. It does, however, look better on the model. Fully agree with your comments, even though I would go a little farther about the Nathan, I think it's so ugly. I am marveling at the smooth, wrinkle-free appearance of the navy and white dress. I guess the first thing is that it is fitted perfectly to the wearer -- but at such a busy time when the dress is worn over a period of many hours, that it skims the body so flatteringly, with not a crease anywhere, amazes me. It is wool, but I'm wondering what it is about the weave, or whatever the magical ingredient is, that creates such a smooth line. I love Max. Second picture she's dumped a luxury bag on the floor and looks. Like she's kicked it over as well. But she's so obviously engrossed in discussing issues with the other lady. Go Maxima!! I don't usually like the cold shoulder lokk but I think this is a very pretty dress, As for Natan - ALWAYS stiff shiny fabrics with no "give" in them! 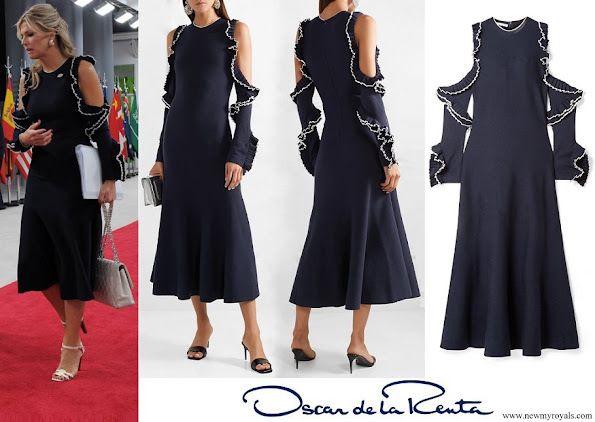 The navy dress by Oscar de la Renta, to much ruffle on the sleeves and the cold shoulder look not my style. 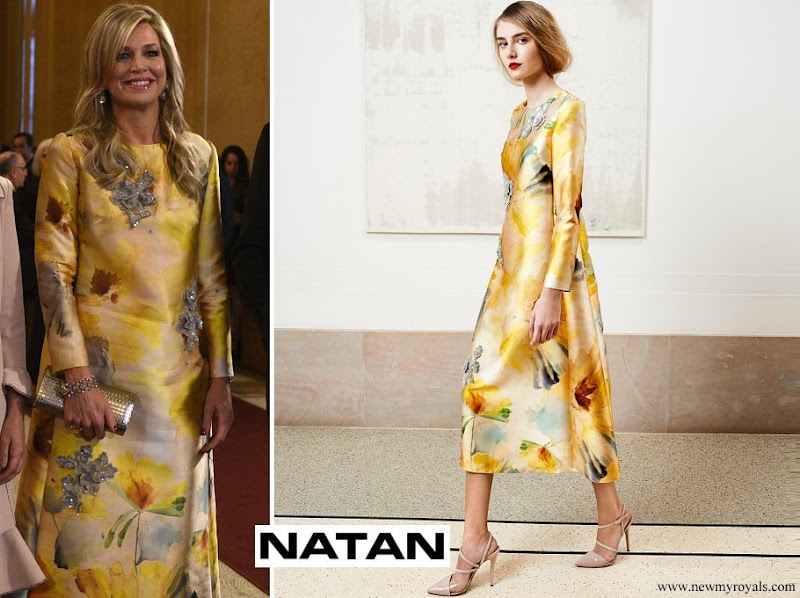 The yellow Natan dress looks Ok but not for this event. In pic 5 all the Ladies look good. She is killing it on this trip! Love love love both looks. 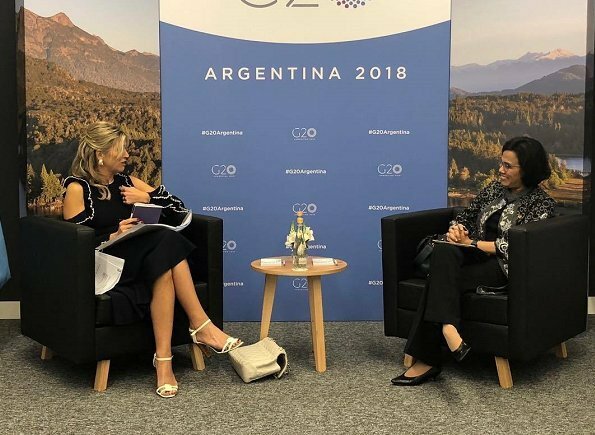 Are Maxima and Juliana wearing the same shoes? Look like she had skin peel/or something done to her face, and it looks great. I would do the same if I had the money. It makes the person look so refreshed. She looks lovely. 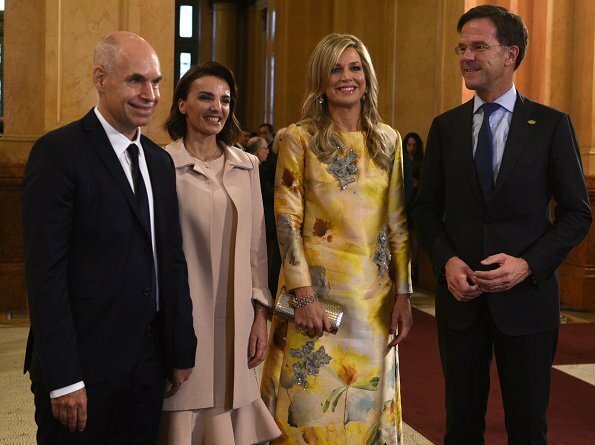 Queen Maxima looks fantastic! Love the navy dress on her! The warm blonde hair color and new hair style looks beautiful and she looks radiant! Bravo! She's got naturally beautiful features but it's her smiley face that makes them really stand out. Always a pleasure to see this woman! wat een leuke jurk ,staat haar goed !!!! I'm not sure whether she's had a refresh or not but I think the hair is really the big difference. Bad lifeless hair will age even the prettiest woman. Her hair looks amazing now, shes trying different styles and she just seems well rested. As someone said above she's had a rough year. I'm glad she's looking and feeling better.